Not to be confused with Component video. Composite video is an analog video transmission that carries standard definition video typically at 480i or 576i resolution as a single channel. Video information is encoded on one channel, unlike the higher-quality S-video (two channels) and the even higher-quality component video (three or more channels). In all of these video formats, audio is carried on a separate connection. On consumer products a yellow RCA connector is typically used for composite video. RCA connector, 1/8 inch minijack plug, etc. Composite video is also known by the initials CVBS for composite video baseband signal or color, video, blanking and sync, or is simply referred to as SD video for the standard-definition television signal it conveys. There are three dominant variants of composite video: NTSC, PAL, and SECAM. A composite video signal combines, on one wire, the video information required to recreate a color picture, as well as line and frame synchronization pulses. The color video signal is a linear combination of the luminance of the picture and a modulated subcarrier which carries the chrominance or color information, a combination of hue and saturation. Details of the combining process vary between the NTSC, PAL and SECAM systems. The frequency spectrum of the modulated color signal overlaps that of the baseband signal, and separation relies on the fact that frequency components of the baseband signal tend to be near harmonics of the horizontal scanning rate, while the color carrier is selected to be an odd multiple of half the horizontal scanning rate; this produces a modulated color signal that consists mainly of harmonic frequencies that fall between the harmonics in the baseband luma signal, rather than both being in separate continuous frequency bands alongside each other in the frequency domain. In other words, the combination of luma and chroma is indeed a frequency-division technique, but it is much more complex than typical frequency-division multiplexing systems like the one used to multiplex analog radio stations on both the AM and FM bands. A gated and filtered signal derived from the color subcarrier, called the burst or colorburst, is added to the horizontal blanking interval of each line (excluding lines in the vertical sync interval) as a synchronizing signal and amplitude reference for the chrominance signals. The burst signal is inverted in phase (180° out of phase) from the reference subcarrier. Composite video can easily be directed to any broadcast channel simply by modulating the proper RF carrier wave with it. Most home analog video equipment record a signal in (roughly) composite format: LaserDiscs store a true composite signal, while consumer videotape formats (including VHS and Betamax) and lesser commercial and industrial tape formats (including U-Matic) use modified composite signals (generally known as color-under). On playback, these devices often give the user the option to output the baseband signal or to modulate it onto a VHF or UHF frequency compatible with a TV tuner (i.e., appearing on a selected TV channel). The professional television production uncompressed digital video videocassette format known as D-2 directly records and reproduces standard NTSC composite video signals, using PCM encoding of the analog signal on the magnetic tape. 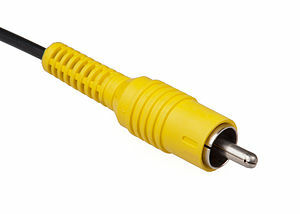 In home applications, the composite video signal is typically connected using an RCA connector (phono plug), normally yellow. It is often accompanied with red and white (or black) connectors for right and left audio channels respectively. BNC connectors and higher quality coaxial cable are often used in professional television studios and post-production applications. BNC connectors were also used for composite video connections on early home VCRs, often accompanied by either phono connectors or a 5-pin DIN connector for audio. The BNC connector, in turn post dated the PL-259 connector which featured on first generation VCRs. In Europe, SCART connections are often used instead of RCA jacks (and to a lesser extent, S-Video), so where available, RGB is used instead of composite video with computers, video game consoles, and DVD players. Video cables are 75 ohm impedance, low in capacitance. Typical values run from 52 pF/m for an HDPE-foamed dielectric precision video cable to 69 pF/m for a solid PE dielectric cable. Some devices that connect to a TV, such as VCRs, older video game consoles and home computers of the 1980s, output a composite signal. This may then be converted to RF with an external box known as an RF modulator that generates the proper carrier (often for channel 3 or 4 in North America, channel 36 in Europe). Sometimes this modulator was built into the product (such as video game consoles, VCRs, or the Atari, Commodore 64, or TRS-80 CoCo home-computers) and sometimes it was an external unit powered by the computer (in the case of the TI-99/4A or some Apple modulators) or with an independent power supply. In the United States, using an external RF modulator frees the manufacturer from obtaining FCC approval for each variation of a device. Through the early 1980s, electronics that output a television channel signal were required to meet the same shielding requirements as broadcast television equipment, thus forcing manufacturers such as Apple to omit an RF modulator, and Texas Instruments to have their RF modulator as an external unit, which they had certified by the FCC without mentioning they were planning to sell it with a computer. In Europe, while most countries used the same broadcast standard, there were different modulation standards (PAL-G versus PAL-I, for example), and using an external modulator allowed manufacturers to make a single product and easily sell it to different countries by changing the modulator. Video game consoles on the other hand were less of an issue with FCC approval because the circuitry was inexpensive enough to allow for channel 3/4 outputs. Modern day devices with analog outputs have typically omitted channel 3 and 4 outputs in favor of composite and S-video outputs (or have switched to using HDMI or other digital formats) as composite and S-video have become more common as inputs for TVs. In addition, many TV sets sold these days no longer have analog television tuners and cannot accept channel 3/4. But because composite video has a well-established market for both devices that convert it to channel 3/4 outputs, as well as devices that convert things like VGA to composite, it has offered opportunities to repurpose older composite monitors for newer devices. The process of modulating RF with the original video signal, and then demodulating the original signal again in the TV, introduces several losses. This conversion also typically adds noise or interference to the signal as well. For these reasons, it is typically best to use composite connections instead of RF connections if possible. Almost all modern video equipment has at least composite connectors, so this typically is not a problem; however, older video equipment and some very low-end modern televisions have only RF input (essentially the antenna jack); while RF modulators are no longer common, they are still available to translate baseband signals for older equipment. However, just as the modulation and demodulation of RF loses quality, the mixing of the various signals into the original composite signal does the same, causing a checkerboard video artifact known as dot crawl. Dot crawl is a defect that results from crosstalk due to the intermodulation of the chrominance and luminance components of the signal. This is usually seen when chrominance is transmitted with a high bandwidth, and its spectrum reaches into the band of the luminance frequencies. This has led to a proliferation of systems such as S-Video and component video to maintain the signals separately. Comb filters are also commonly used to separate signals, and eliminate artifacts, from composite sources. When used for connecting a video source to a video display that supports both 4:3 and 16:9 display formats, the PAL and NTSC television standards provide for signaling pulses that will automatically switch the display from one format to the other. This is called widescreen signalling (WSS). Since TV screens hide the vertical blanking interval of a composite video signal and even crop the edges of the picture, extensions have been implemented by taking advantage of these unseen parts of the signal. Examples of these extensions include teletext, closed captioning, digital information regarding the show title, transmitting a set of reference colors that allows TV sets to automatically correct the hue maladjustments common with the NTSC color encoding system, etc. Other extensions to the standard include S-video; S-video is an extension to the standard because it uses parallel signal paths for luminance and for chrominance (color), of which both of them can be connected to a composite video input but with either monochrome (luma), or uniform-luma color (chroma) unless merging the signal paths with a filter was done. ^ "Video Basics". Maxim Integrated. Retrieved 2018-07-14. ^ Robert Silva (November 8, 2017). "Composite Video - The Basics". Lifewire. Retrieved 2018-07-14. ^ SMPTE STANDARD for Television - Composite Analog Video Signal - NTSC for Studio Applications. 2004. ^ "US Patent 4323915". US Patent and Trademark Office. Archived from the original on 20 December 2016. Retrieved 12 May 2014. 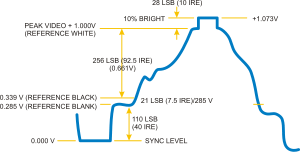 ^ "LC-1 Audio Cable Design Notes". Blue Jeans Cable. Archived from the original on 2011-11-28. Retrieved 2012-01-21. ^ "Elwro 800 Junior - MCbx". oldcomputer.info. Archived from the original on 18 March 2017. Retrieved 5 May 2018. Maxim - Apr 17, 2001 - Video Basics Tutorial covering CVBS format structure.